Cave Creek is an exclusive artistic desert community north of Phoenix. Panorama Hills Monthly Newspaper is delivered to many non-gated homes in the Cave Creek area and distributed at news stands at gas stations, resorts, restaurants and the Chamber of Commerce. This page will feature news related to the Cave Creek community. CAVE CREEK � The wildflower season is upon us, and what better way to experience its glory than on horseback? �You can really enjoy the wildflowers this way,� said Deb Bitton, co-owner of Cave Creek Trail Rides, based at the Cave Creek Regional Park, just north of Carefree Highway in Cave Creek. �A trail ride gives you a chance to get out, enjoy the desert, and let the horses watch where they step.� Wildflowers typically begin blooming in early- to mid-March. �Based on the rains we got this winter, we should see an above-average wildflower display this year � possibly even spectacular!� said Amy Ford, the park�s supervisor. You don�t have to be a skilled horseman to enjoy the event. Rides are open to all ages, six and up. Jeff and Deb Bitton�s 40-year experience translates to safe trail rides on well-trained horses. Trail rides can be scheduled throughout the day, any day of the week. Sunset rides return to the stables at dusk, taking best advantage of the radiant scenes. Cave Creek Trail Rides - Jeff and Deb Bitton began offering trail rides in Stanley, Idaho in 1969. They opened Cave Creek Trail Rides in 1999, creating a true Western experience just on the northern fringes of the Greater Phoenix area. Families, friends and neighbors, as well as corporate, school, church and civic groups can all have fun while learning about horses and spending quality time together. Cowboy and cowgirl boots, hats and chaps are available for those who want to dress the part. And toy guns along with lassos add to the photo opportunities. More information - Cave Creek Trail Rides, located at 37019 N. 32nd St. Cave Creek, 85331, is open every day from Columbus Day weekend through the first weekend of May. Round-trip transportation can be scheduled through Pepper�s Private Car Service, 602-501-3328 or www.pepperscarservice.com . 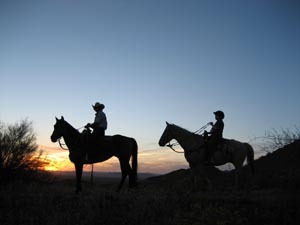 More information about Cave Creek Trail Rides is available at 623-742-6700 or www.cavecreektrailrides.com . Please join the New River/Desert Hills Community Association (NR/DHCA) at their Tuesday, January 12 meeting starting at 7:30 PM. This special meeting will be held at Crossroads Christian Fellowship at 42425 N. New River Road. Arizona has more National Monuments under the National Landscape Conservation System than any state. Peggy Biegler, Executive Director of the Friends of the Agua Fria National Monument, will share photographs and information about these special places that are easily accessible in our state. Each one was preserved because of special characteristics, wildlife, plants, archaeological or cultural resources. No two monuments offer the same experience in the wonderful variety of climates and landscapes Arizona offers its residents. These will be preserved for future generations to enjoy in a way that national parks and other recreational areas will not. Come learn about these unique treasures of Arizona. The meeting is open to the public and all are welcome to attend. The New River/Desert Hills Community Association is a non-profit volunteer organization dedicated to protecting our community and preserving its rural lifestyle. We do this by keeping ourselves informed and providing broad input to a wide array of county, state, and federal agencies and elected officials. This meeting is your opportunity to be part of the solution. Come, enjoy, and join! Call 623-742-0150 or visit www.nrdhca.org for more information. NORTH COUNTRY CONSERVANCY � ANNUAL MEETING SPEAKER THELDA WILLIAMS, DESSERT POTLUCK, AUCTION & MORE!! North Country Conservancy�s is the leader of efforts to preserve the natural landscape and wildlife habitat in the Daisy Mountain/Anthem/New River/Desert Hills region. The keynote speaker, Thelda Williams (Phoenix District 2 Councilwoman), will be sharing her views on the importance of Pioneer Village and Daisy Mountain. NCC will also provide a short review of their 2009 accomplishments and propose their 2010 plans. RSVP: ahutchinson@daisymountain.org or 623-742-6514. Space is limited!!! More: Dessert potluck, a silent auction and a raffle among other activities. Items for the silent auction are still being sought. Those interested in contributing to the auction or attending the meeting are asked to contact Ann Hutchinson at 623-742-6514 or at ahutchinson@daisymountain.org. Find out how to "Write That Book!" for only $10. And 10% of all book proceeds from workshop book sales will benefit the library. The winners cross the finish line - and the Pages team wins! As we approach the end of 2009, we at Pages would like to thank each of you for your support. Thanks to all of you, we met then exceeded a conservative sales goal for 2009 in spite of the bad economy. We are well aware of the competition for your dollars and that we all need to save where we can, so we are especially appreciative for your business. We take pride in being your local bookstore and giving everyone the best customer service we can. We are knowledgeable about books in general with specific knowledge of different genres and what is on the shelves in our store. Plus, we all enjoy being "book detectives" and finding titles when all that the customer has is part of a title, or even just a description of the book. We hope you continue to enjoy challenging us as well as exploring the world of books with us throughout 2010 and beyond. "a good time, if you're not a box..."
The Pages race car - dig those dual exhaust pipes! See more fun stuff on our Photo Album page - just clickhere! Pioneer Life in Cave Creek, Arizona, 1890-1940"
Written by Cave Creek resident Grady and published here in Arizona, signed copies of "Homesteading Along the Creek" are now available at Pages for $20. Reserve your spot and/or a copy of the book now by phone 480.575.7220 or email. "A Must Read. I didn't think so, then decided to read it, then fell in love with The School of Essential Ingredients." "The School of Essential Ingredients" is available now in hardcover at Pages for $24.95. The paperback edition will be available Jan. 5 for $15. Due to limited seating, please reserve your place and book now at Pages - 480.575.7220 orinfo@pagesnewandrare.com. Can't make an event? Give us a call or email & we can have a pre-paid copy signed and held for you! Learn how to understand your dreams, and how to use dream groups and journals to unfold your dream's meaning and significance. Internationally known author and dream work innovator Dr. Jeremy Taylor will be the special guest at Using Dreams for Personal Growth, a two-part dream interpretation seminar on Friday, September 11th and Saturday, September 12th at the Spirit in the Desert Retreat Center in Carefree. Friday's segment is a Q & A session from 6:30pm-8:30pm. Saturday's segment is a dream group session from 9:00am-6:00pm, with a break for lunch. Taylor who has 40 years of dream work experience leads both segments. Tickets are only $29.00 for Friday evening, $139.00 for the Saturday session or $149.00 for both sessions. Lunch is $12.00. Registration is limited and available online. Dr. Taylor is an author and the co-founder and past president of the International Association for the Study of Dreams, and director of the Marin Institute for Projective Dream Work. The event is presented by Dr. Allen Nohre and Spirit and Soul Seminars of Carefree. Nohre has worked with numerous internationally known dream experts. He began his training in dreams at the C.G. Jung Institute in Zurich, Switzerland. The Desert Foothills Library presents a new Great Books discussion group for lovers of great literature and in-depth discussion of ideas. Monthly meetings will take place at the library beginning Wednesday, September 23rd from 6:00 to 8:00pm. For information call 480-488-2286. Initial discussions will include "The Two Brothers" by Leo Tolstoy; The Declaration of Independence; and "Because I Could Not Stop for Death" by Emily Dickinson. Desert Foothills Theater announces the opening of DFT Conservatory of Performing Arts (COPA) offering theater training for adults and youth. Classes will be held at the new FCF-Holland Community Center located on 60th Street, south of the Carefree Highway. Adult classes include play writing, acting/scene work, acting/monologues, musical theater and others. Youth classes include voice class, movement for theater, acting/scene work, acting for film and much more. Instructors include Kevin Glenn, Meribeth Reeves, Lori Vander Maten, Darlene Duffy, Diedre Kaye, Alexx Stuart, Lisa Andres and others. You may find a full class listing, class descriptions, instructor bios and register online at Desert Foothills Theater website at http://www.desertfoothillstheater.com. You can also pick up a FREE catalog at the FCF-Holland Community Center or call 480-488-1981 and one will be mailed to you. The DFT is a program of the FCF (formerly the Foothills Community Foundation). Join bargain hunters and treasure seekers at this unique outdoor flea market. Tucked behind Big Earl's Greasy Eats at 6135 E. Cave Creek Road, the event offers wacky items, awesome and amazing finds. There are t-shirts, colorful rugs, clothing, exotic jewelry, folksy dishes from Grandma's kitchen, retro games and toys. Nothing is mass-produced, with many hand-made and one-of-a-kind collectables. Cowboy and cowgirl hats, hand-painted keepsake boxes, old paintings, vintage clothing and furniture are just a few of the eclectic prizes waiting to be found. Thieves Market is a home grown event and a monthly shopping experience you won't want to miss. The 5th annual Cave Creek Wild West Days event is a festive weekend is coordinated by the non-profit Cave Creek Merchant�s Chamber of Commerce. Admission is free. FREE Jeep Service by Johnny Ringo will run from Harold�s Cave Creek Corral and the Shooter�s Arena down to the La Casona� Luv Shack Kid�s Zone� with stops in between. 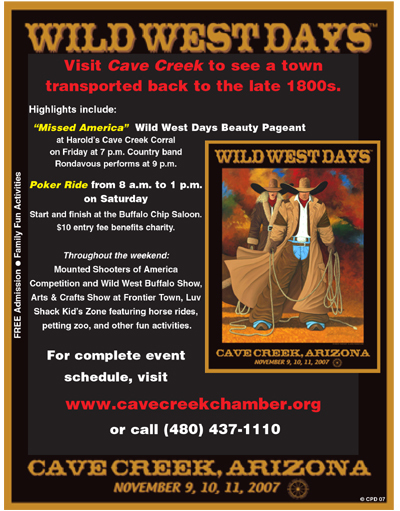 For more information about Cave Creek Wild West Days, call (480) 437-1110 or visit www.cavecreekchamber.org . Thursday, November 8th, 2008 �Cowboy Spikes & Spurs� Golf Tournament 12:30 p.m.followed by a Western buffet dinner at the Tonto Bar & Grill. Rancho Manana Golf Club, 5734 E. Rancho Manana Blvd., in Cave Creek. Shotgun golfers can dress in their favorite cowboy/girl attire and enjoy the links. This four-person scramble will feature contests for closest to pins, longest drive, longest putt, and best western outfit, �Hole-on-One� chance to win a 2007 Dodge 4x4 Pick-up Truck donated by Desert Rose Florist and Ed Moses Dodge. Contact: Dale Samar (480) 488-0398. Cave Creek Museum Exhibit and Raffle 6140 E. Skyline Drive Museum Hours on Friday: 10 a.m. to 4:30 p.m. Throughout Wild West Days, visitors to the Museum will automatically be entered to win two tickets to the Museum�s holiday gala and dinner theater event on Friday, November 30. Come learn about Cowboy Artists of America co-founder Johnny W. Hampton, who lived in Cave Creek in the 1960s. Thanks to the generous donation of the Peagler family, Hampton�s sculptures �Spooked,� �On the Prod,� and �Throwing the Hooley-Ann� are on display. Be sure to also check out the Museum�s newly renovated Archaeology Wing. Entrance fees are $3 for adults, and $2 for seniors and students over age 12. Group tours: $2 per person. Call (480) 488-2764. �Missed America� Wild West Days Beauty Pageant Contest begins at 7 p.m. Harold�s Cave Creek Corral, 6895 E. Cave Creek Road $25 Pageant entry fee made payable to the Cave Creek Merchants Chamber of Commerce. Female country band Rondavous will take the stage at 9 p.m. Free admission. Call (480) 488-1906. Car Show 6p.m. Big Earl�s Greasy Eats 6135 E Cave Creek Rd Check out the vintage cars and have some eats! Saturday, November 10th Poker Ride 8a.m. to 1p.m. Buffalo Chip Saloon Ride starts and endsstops at TC Thorstenson�s. Check in and awards will be done at the Buffalo Chip Saloon, 6811 E. Cave Creek Rd. Ride through Galloway wash, The Town of Cave Creek trails making 6 stops for cards. Enjoy cool refreshments at the Buffalo Chip and enjoy cool refreshment while the best poker hands receive their prize. $10 entry fee, make checks payable to Cave Creek Merchants Chamber (CCMC) Contact: Gary Monaghan, (480) 772-0022 or Michelle Duke, (602) 999-0303. Mounted Shooters of America Competition and Wild West Buffalo Show 1 p.m to 3 p.m. Wild West Shooter�s Arena (Cave Creek and Vermeersch Roads). Other activities in or near this area: pan for gold demonstration Trick Riders, gun spinner, buffalo show, Native American Dancers and Cave Creek Wild West Days Poster Artist Lance Headlee will sign posters. Lots of extras for the whole family. Contact: T.C. Thorstenson, (602) 283-3256. Luv Shack Kid�s Zone 10 a.m. to 5 p.m. Frontier Town 6245 E Cave Creek Road Cool hang-out for kids and the family. This area features bouncer, horse rides, horse painting, petting zoo, face painting, bean bag toss, pictures with horse, rope cow head, kissing horse and cake walk! 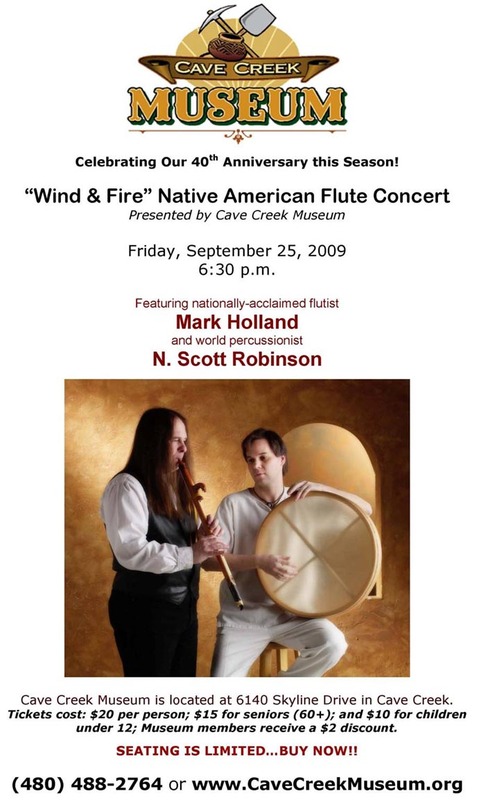 Contact: Marc Peagler, (480) 488-9129. Strolling Minstrels Watch for the strolling minstrels throughout town. Sunday, November 11th Dutch Oven Breakfast, Cowboy Hoe Down 10 a.m. o 1 p.m. Dutch oven breakfast 1 p.m. to 5 p.m. Cowboy Hoe Down The Wagon Camp at the Buffalo Chip, 6811 E. Cave Creek Road. A heart-warming morning of breakfast cooked Dutch Oven campfire-style by Cowgirls Forever in a Western setting. Stick around for lunch and early dinner as music continues with the Horse Hero Hoe Down of original country, country-western, gospel, bluegrass, jazz, blues, light rock tunes by members of the Arizona SongWriters Association. Call (602) 686-6282. Luv Shack Kid�s Zone 8 a.m. to 5 p.m. Frontier Town 6245 E Cave Creek Road Cool hang-out for kids and the family. This area features bouncer, horse rides, horse painting, petting zoo, face painting, bean bag toss, pictures with horse, rope the cow head, kissing horse and cake walk! Contact: Marc Peagler, (480) 488-9129. Cave Creek Museum Exhibit and Raffle 6140 E. Skyline Drive Museum Hours on Sunday: 1 p.m. to 4:30 p.m. Throughout Wild West Days, visitors to the Museum will automatically be entered to win two tickets to the Museum�s holiday gala and dinner theater event on Friday, November 30. Come learn about Cowboy Artists of America co-founder Johnny W. Hampton, who lived in Cave Creek in the 1960s. Thanks to the generous donation of the Peagler family, Hampton�s sculptures �Spooked,� �On the Prod,� and �Throwing the Hooley-Ann� are on display. Be sure to also check out the Museum�s newly renovated Archaeology Wing. Entrance fees are $3 for adults, and $2 for seniors and students over age 12. Group tours: $2 per person. Call (480) 488-2764. Bison Ranch Percheron Hitch 10:00 to 4:00 pm Parking lot at Motor Heads Restaurant 6900 E Cave Creek Rd. �Wild West Days Party� Music and dancing at the local hang-outs throughout town!